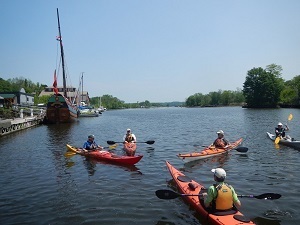 DEC recently announced that $1,115,000 in grant funding is now available to help communities in the Hudson River estuary design and improve recreational access and enhance education for people of all ages and abilities. Approximately $950,000 is available in the “River Access” Request for Applications (RFA) for projects along the shoreline of the Hudson estuary that provide new or improved accessibility at new or existing access sites for boating, fishing, swimming, and/or wildlife-dependent recreation. This funding is from the NYS Environmental Protection Fund and the Natural Resources Damages Fund (NRD). $165,000 is available in the “River Education” RFA to support projects and plans to enhance education about the estuary along the tidal waters of the Hudson and make opportunities to learn about the Hudson River Estuary more accessible to a wide-range of people. This funding may be used to support development of plans or curriculum, purchase of equipment, development of web sites or mobile phone apps, and/or construction of physical improvements. The deadline for applications is August 22, 2018 at 3 p.m. The RFAs for “River Education” and “River Access” are available online through the NYS Grants Gateway. General information about the grants is available on the DEC website.